David Tennant is launching his own podcast where he’ll chat to some of his famous friends. Rami Malek is starring in a new thriller podcast titled Blackout. Derek Jacobi is to make his return as The Master – but not in the main Doctor Who series. Instead he will reprise his role for four new audio stories from Big Finish. Lots to talk about on this week’s That’s A Wrap podcast with Angie Greaves. We’ve got new on special screenings paying tribute to Sir Roger Moore, David Walliams meeting his fans and the return of a beloved cartoon series. Angie Greaves and I are back with a new edition of our podcast That’s A Wrap. This week, we’re discussing everything from the return of Roseanne to new Prince music and a Lifetime Achievement Award for the great James Earl Jones (Angie and I have differing opinions on his greatest role…). This week Angie Greaves (from Magic FM) and I are discussing everything from Bill Murray’s classical album to Stephen Fry’s new book about the ancient Greeks. Time for another That’s A Wrap podcast with my friend Angie Greaves. 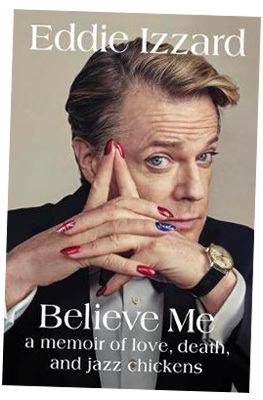 This week, we have news on Eddie Izzard’s autobiography called Believe Me: A Memoir of Love, Death and Jazz Chickens. Angie Greaves and I return with another edition of our podcast That’s A Wrap, packed full of entertainment news. It’s another That’s A Wrap entertainment news podcast with Angie Greaves and me. This week we’ve got everything covered. In book news, we’re talking about Jamie Lee Curtis’s anti-selfie book, Michael Stipe’s photo book and Kevin Hart’s tale of life lessons. Loads of old Downton Abbey stars are joining forces once again for a new film called The Guernsey Literary and Potato Peel Pie Society. Plus, Brie Larson is playing the first women to run for US President (not Hillary), but Amy Schumer’s dropped out of the Barbie movie. A former Loose Woman is heading to the stage on London, Jessie Wallace is starring in a new stage thriller, and the Mean Girls musical will premiere in Washington DC.